Flat-Free turf tread tire is the perfect wheelbarrow tire: lightweight, great bounce, excellent load capacity, and designed to perform like an air-filled tire without the flats. Can be used with a majority of wheelbarrows, welders, roof equipment, and much more. Turf tread for better traction and less marking on wet lawns or soft soils. 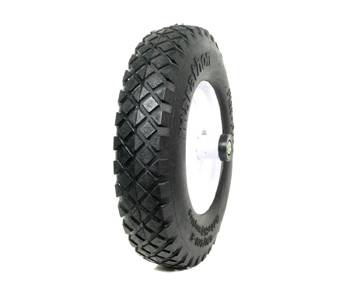 Tire type: 4.80/4.00 8". Weight: 10.2 lb. Size: 4.1" W x 16" Dia. Capacity: 500 lb. and more. Bearings: 5/8" shielded ball bearings. Hub: 6" L centered.